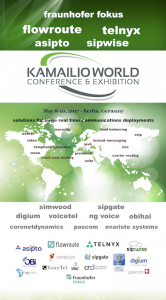 Just few days and the 5th edition of Kamailio World Conference & Exhibition starts. Two days and a half full with technical tutorials, presentations, open discussions and demos. With more participants than the previous edition, the event consolidates the ecosystem around Kamailio and other VoIP related projects and products such as Asterisk, FreeSwitch, Janus, Jitsi, OpenBaton, CGRateS, Homer Sipcapture, SIPVicious, RTPEngine, Zoiper or SEMS. Along the event, Obihai, Telnyx, Digium, NG Voice, Core Network Dynamics and FhG Fokus will be present in the exhibition area showing demos of their services and products. With the great help of our sponsors, FhG Fokus, FhG Forum, Flowroute, Telnyx, Sipwise, Asipto, Sipgate, Simwood, Obihai, Digium, NG Voice, Core Network Dynamics, VoiceTel, Evariste Systems, Pascom and VUC, we are ready for another amazing edition of Kamailio World! See you in Berlin next week!